Stephen Kirkland, was born in Oneida county, New York, sixteen miles south of Utica, in the town of Bridgewater, in the year 1814. His father was Reynolds Kirkland, and his mother before marriage was Percy Pratt, both of whom were natives of Essex, Connecticut. His ancestors settled in New England more than two centuries ago, coming originally from Scotland and England. 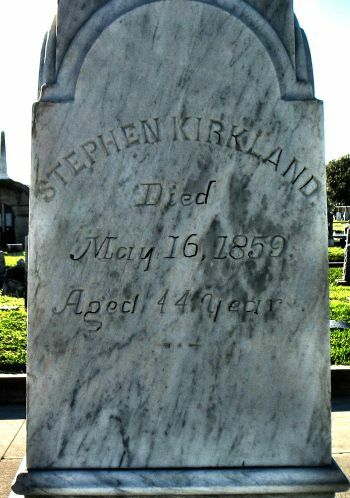 Stephen Kirkland was reared in his native county. He was troubled with asthma, and on the advice of his physician came to Texas in 1838, landing at Galveston in the summer of that year. Galveston had then but recently been laid out, and Mr. Kirkland, who came in company with Jacob Briggs, from Oswego, New York, afterward used to tell with what difficulty they got ashore, there being no wharves here at that time. 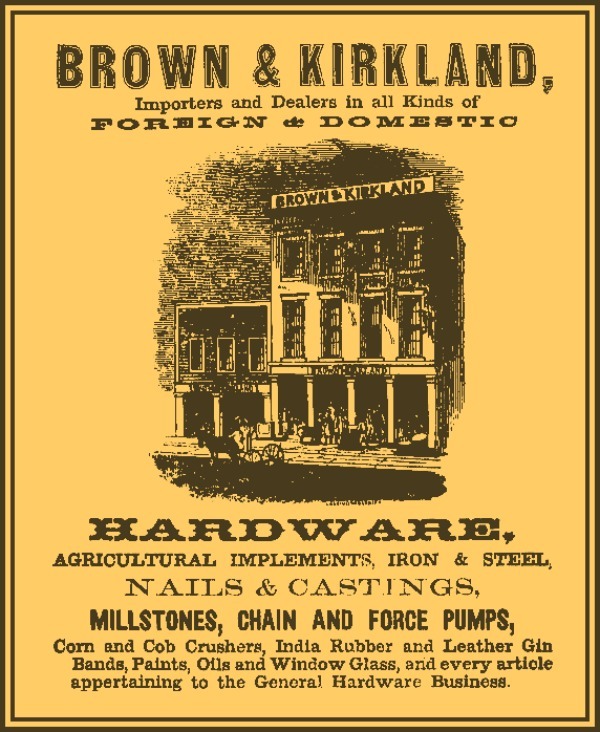 For some years after coming to Galveston, Mr. Kirkland followed different pursuits until a short time prior to 1850, when he formed a partnership with James M. Brown and embarked in the hardware business. He was successfully engaged in this business until his death, accumulating some means, represented by his mercantile interest and investments in Galveston city property. 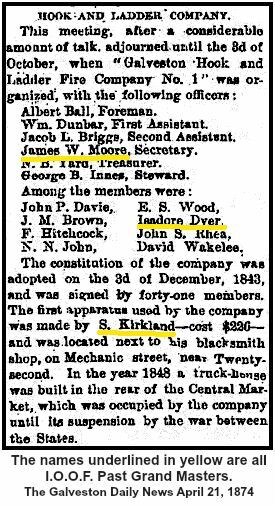 As early as 1841, the year after the incorporation of Galveston, Mr. Kirkland's name appears as one of the Aldermen of the city, and he was twice thereafter a member of the board, in 1847 and 1853. He was always proud of Galveston, interested himself in its future, and strove to promote that interest in all practicable ways. He helped to organize one of the first fire companies ever organized in the city, of which he was for some years an active member; and he also took an active part in establishing here the first two fraternities organized in the place, the Masonic and Odd Fellows. On November 12, 1850, at Galveston, Mr. Kirkland married Miss Mary A. Emerson, daughter of Joseph and Rebecca Emerson, and a native of Thomaston, Maine, she having come to Galveston in 1846. Her father, who had for many years been a merchant in New Orleans, came to Galveston in the early 1840s. He was a resident of this city some eight or ten years, when he went to California, where he died. Mrs. Kirkland's mother died in the North before the removal of the family to Texas. 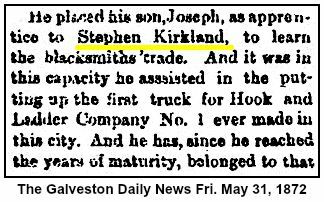 After a residence of little over twenty years in Galveston Mr. Kirkland died. May 16, 1859, being then in his forty-fifth year. Surviving him he left a widow and three children. 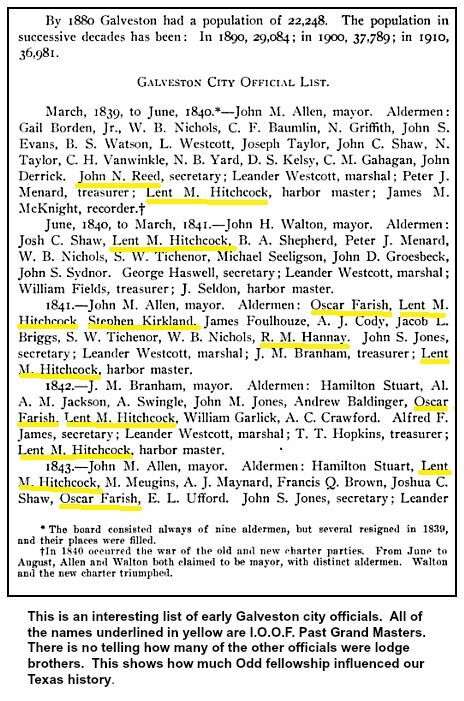 The eldest, a son, Stephen Edwin, died some ten years ago (in 1884), aged thirty-three, unmarried; Mary A., the second, now Mrs. Adam Bardash; and the youngest, Emma H., now Mrs. Ormerod Heyworth, reside in Galveston, as does also their mother. Mr. and Mrs. Bardash were married December 15, 1875, and have one daughter, Hortense. Mr. and Mrs. Heyworth were married August 17, 1880, and have one daughter, Emma C. So that of this pioneer settler but four descendants are now living, and none bearing his name. 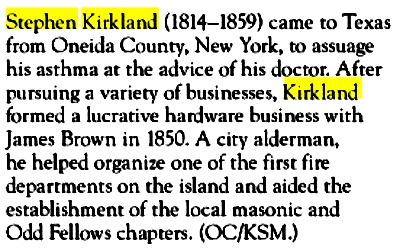 Mr. Kirkland had a large number of brothers and sisters, but none of them ever became residents of Texas, most of them remaining at the North. The family was noted for longevity, he being the only one that died in middle life. His mother lived to the advanced age of ninety-two. History of Texas, together with a biographical history of the cities of Houston and Galveston, etc., Chicago: Lewis Pub. Co., 1895. 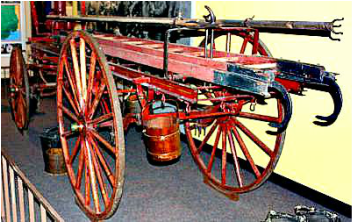 Hook & Ladder rig from Comfort, Texas. It could be similar to what Kirkland built. in a lucrative hardware business. Located at Old City Cemetery in Galveston, Texas.